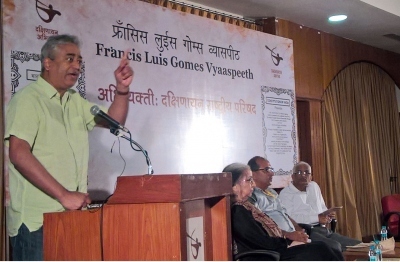 Patriotism is the concept based on humanism and love for the people, but the concept of pseudo-nationalism is today developed into the concept of spreading hatred against others, said India’s eminent TV journalist Rajdeep Sardesai. 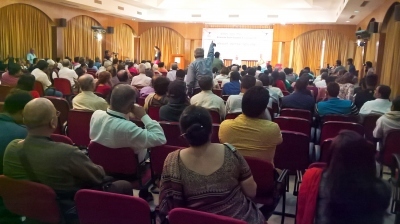 He was speaking at a seminar on ‘Nationalism, Patriotism and Humanism’, organised at the first national level Dakshinayan Parishad that began in Goa yesterday evening. “It is very easy to spread hatred in the name of nationalism, but difficult to spread the spirit of secularism and patriotism”, he said. Rajdeep preferred to term it as pseudo nationalism, which needs to be countered by alternate narration and mediums like digital media and reaching out to large number of people of the country with a right perspective. Rajdeep also hit out at the demonetisation policy of Prime Minister Narendra Modi and glorifying it as a bold step of a Nationalist. “Your nationalism makes me stand in queue, but doesn’t allow me to ask questions”, said the consulting editor of India Today TV. Rajdeep also opined that the first step of arresting black money should have been started with election funding, demonetisation should have been the last step. “But the PM doesn’t want to touch the issue of election funding because his own interest is involved in it”, he said. The author of “2014: The Election that Changed India” also observed that the BJP is reported to have spent Rs 65,000 crore for 2014 Lok Sabha election. Where did this money come from, he asked. He also felt that demonetisation has taken place when five states are going for Assembly election including one of the largest states like Uttar Pradesh. He also pointed out at the reports of 641 Indians listed among the people having Swiss Bank accounts. “A fisherman in Goa told me: Saab, badi machli to bhag gayi, chotti machchli jaal mein fansi,” said a journalist of Goan-origin amidst applause. Rajdeep also wondered how Modi could take such a decision when 86 per cent of India’s economy moves around 500 and 1000 rupee notes. He also revealed that Modi took this decision without consulting even his own chief economic advisor. “The attitude of I, Me & Myself has created today’s situation. We have elected a democratic dictator”, said the senior journalist. He also disclosed how media was informed by the government about Modi’s mother going to the bank and stand in a queue to exchange her money. Rajdeep also observed that Modi is systematically targeting the aspirational India of youth and the neo-middle class. “His next step would be to reduce the income tax”, he predicted. Knowing Modi closely since L K Advani’s Yatra, Rajdeep said the PM today doesn’t like anybody to question him. “He speaks for over one hour in every rally, but doesn’t find time to reply to the questions media has”, he said. Rajdeep also said he is ashamed of today’s media as many editors are seen busy taking selfies with the PM when he invites them for get-togethers. The veteran journalist also observed that large number of media is today sold out to the ruling classes. “As a journalist, my first priority would be to the people of India. People first, then comes the nation”, he said. Stating that questioning is the core of the vibrancy of Indian democracy, Rajdeep said neither media nor the people can be silenced in the name of nationalism. The surgical strike on black money are only on those who are standing in a ques to withdraw their own money. on 26th most of the youth of Sanvordem constituency ,their vehicle was filled with petrol of Rs 300/- and today the day of sanklap rally at sanvordem all the four wheeler are paid Rs 2000/, two wheeler Rs500/- to attend the rally. there will be no bus services with all the buses attending the rally Are all who are attending the rally will be paid in cash of rs 1000 and 500 denomination. It is condemable not able to withdraw our own money that is in the Bank. What he is doing now, he silent, isn't he barking like, exercising his right of freedom of speech? clearly he is deranged. Go to Bihar. What rajdeep speaks about? " Rajdeep also opined that the first step of arresting black money should have been started with election funding, demonetisation should have been the last step." Being a journalist is he unaware that election funding is done through 500 & 1000 currency notes? Currency used by common man was always in hundreds and a few five hundreds. Will Rajdeep answer " from where the 500 & 1000 notes which are now deposited in banks after demonatisation have come from ? and will he answere who is now holding 100 rupees currency? Is it possible to bring Monkey-hunters into the mainstream? BJP exposed on 80% local quota in jobs; but why are the outsiders coming?